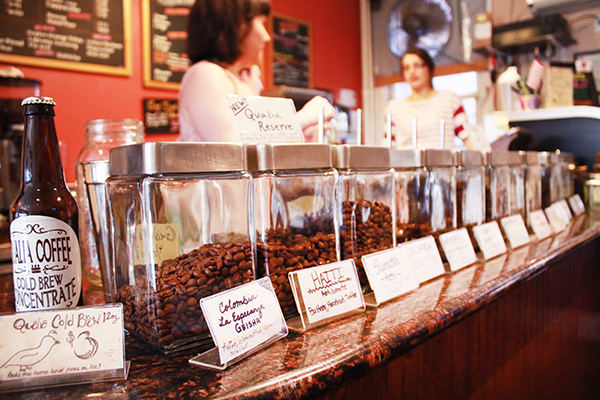 Qualia Coffee on Georgia Avenue is the perfect first stop for your trip to Park View. Right after I returned to D.C. after spending spring break in Honduras, I rushed to Yelp to find the nearest Honduran restaurant. I needed comida típica, stat. Luckily, D.C. has almost never met an ethnic cuisine it didn’t like. My search led me to spending a sunny afternoon exploring Park View, a small and rapidly gentrifying neighborhood with a sizeable Central American community north of Howard University and accessible through the Georgia Avenue-Petworth station on the green and yellow lines. I had never ventured farther east than Columbia Heights, but I liked what I found in this residential-yet-vibrant pocket of Northwest D.C. I first headed north through the main business center, Georgia Avenue. I stopped at Qualia Coffee (3917 Georgia Ave. NW), a brick building with steps up to a porch that peered over a line of row houses. The only signs that discerned the cafe from its neighbors was a large red awning and a real estate post with a hanging chalkboard that listed specials for the day. It was refreshingly unpretentious and had a giant coffee roaster churning in the back. On a warm day, the fenced-in seating area beckons you to linger. The baristas made me a mean London Fog ($3.75) – two-thirds brewed Earl Grey tea, one-third steamed milk with a splash of vanilla syrup – and happily offered suggestions for where to go next. 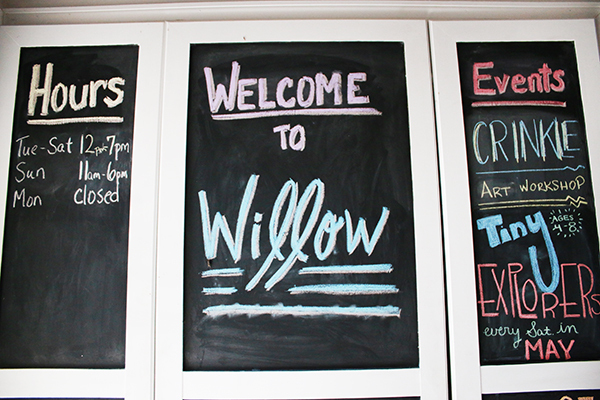 Willow Fashion, where great clothing finds come much cheaper than those in Georgetown. Their advice led me to Willow Fashion (843 Upshur St. NW), a small boutique that echoed the vibe of Anthropologie, with the important distinction that everything was affordable, like the $10 vintage plaid blazer with which I fell in love. One section was lined with vintage clothing in pristine condition, and the rest of the store was stocked with brightly colored dresses and shirts that maintained a balance between office-appropriate and lively. In between the racks were folksy home décor items perfect for spring. My favorite tchotchke was an $18 set of checkered brown-and-white mugs that seemed like a throwback to the 1970s and fit inside one another – a cute space-saver for dorms. Willow’s owner directed me across the street to Fia’s Fabulous Finds (806 Upshur St. NW), which was also full of shockingly affordable yet attractive used pieces. I found a short red, patterned A-line skirt for just $10, and other pieces hovered around below $25. The store also had a room in the back devoted to shoes on shoes on shoes, which is a definite draw. In both stores, prices were significantly lower than any comparable items sold around Foggy Bottom. Park View is off the beaten path enough to turn off convenience-focused Beltway fashionistas, so the selection isn’t picked over and the store clerks are exponentially more friendly and appreciative of your patronage. My stomach told me to head back toward the Metro and south to Catrachito’s Deli (3555 Georgia Ave. NW). While I thought Qualia Coffee blended in with its surroundings, Catrachito’s was only visible to passersby by a half-erased whiteboard, displaying a hastily drawn Honduran flag, that was propped in the window of a convenience store. Adventurous diners had to enter through the convenience store and find the kitchen in the back. I never saw a menu and there was only one table, which was already filled with an array of friends and relatives chatting and eating, like most immigrant-owned restaurants. No matter how awkward the situation might become, I couldn’t leave without satisfying my craving. But my Spanish broke the ice, and everyone smiled at this clueless college student. I asked the cook for baleada, Honduras’ most popular staple: a tortilla filled with beans, scrambled eggs, cheese and cream. My meal cost only $3.39, much cheaper than a plane ticket to Central America. Park View’s anonymity is its greatest asset. I’ll be back for a Slavic/Scandinavian Easter Brunch at Domku Bar & Cafe (821 Upshur St. NW), and I’m already counting down the days.